A tricky one, this. 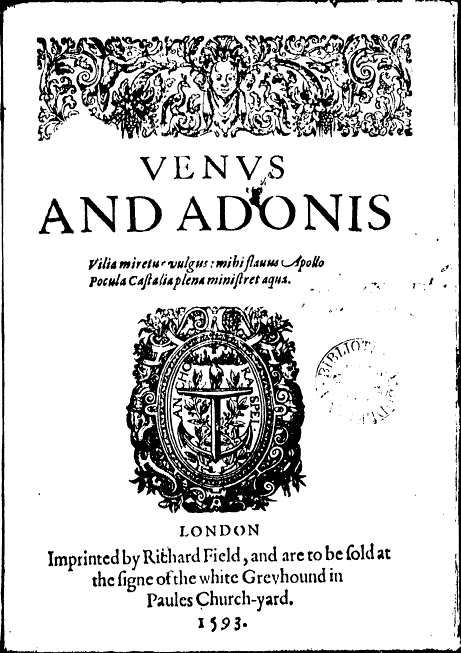 Whatever you make of the plausibility of Oxford's reasons for not putting his name on the plays, his reasons for not putting his name on Venus and Adonis are completely unfathomable. The year 1593 would have been the perfect time for Oxford to launch himself as the greatest court poet of the age. It would have guaranteed him the favour of the monarch, to whom, as an Earl, he could have dedicated it. Had Venus and Adonis appeared under his name, it would have produced many of the rewards he seemed to be energetically seeking by other means. Will, however, not only put his name on it, he wrote a long dedication to the Earl of Southampton, Oxford's peer in the Elizabethan hierarchy. Once again, this seems fatal to the case for Oxford's authorship. It is clearly written from a social inferior to someone higher up the social scale. Oxford, if anything, outranked the younger Earl. Of all the many obvious reasons that bar Oxford's authorship, the one that I think most convincing is the stylistic difference between this preface and Oxford's undisputed preface to Bedingfield's Cardanus Comfort. The words 'The first heir of my invention', which unequivocally refer to the work which they precede, are the overture to a type of extended metaphor which is entirely outside Oxford's range. The elegance of the build from 'heir' to 'god-father' to 'harvest' then 'survey' contrasts starkly with the Earls' lumbering comparison of a physician being better able to assess the interests of his patient than the patient is himself. With the playhouses closed, Shakespeare took advantage of a generous patron and followed one successful published poem with another. Once again, the dedication shown below is unequivocally that of a dutiful inferior to someone at the top of society's ladder. However, with the playhouses open, that was an end to long poems, patronage and dedications. Despite the success of both heirs to his invention, Will preferred the playhouse. Oxford preferred instead to continue his assiduous efforts to snag a sinecure. For a look at how Oxfordians try to get round the dedications and a solid demolition their claims, Terry Ross's article is excellent. *Let what is cheap excite the marvel of the crowd; for me may golden Apollo minister full cups from the Castalian fount. Note that when Shakespeare quotes Ovid, he quotes the original NOT the translation made by Oxford's uncle, William Golding which Oxfordians claim was Will's source for all things Ovidian. In fact he parodies Golding's verse in A Midsummer Night's Dream.